More than 20 years of experience and always desiring to explore new therapeutic methods. 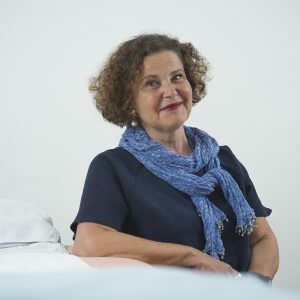 Sylvie Wyler, acupuncturist since 1993, obtained a Rosemont College diploma (Department of Higher Education in Quebec), where she obtained the Excellence prize. A year later she opened a practice in Lausanne. Her interest in atypical situations and her life experience encourages her to integrate institutional environments. For 12 years (1995-2007), she has participated as a consultant for the Levant Foundation in Lausanne and for 4 years (2001-2005) at the psychiatric hospital of Cery. She used the NADA (National Acupuncture Detoxification Association) method acquired in New York, which allows to diminish anxiety, improve sleeping hours and sustain the coming off of alcohol, drug or medicine. Every year, around 1000 treatments in accordance with the NADA method are exempt from these two establishments. Her interest for the patients and the human aspect of her job have encouraged her to train herself in self-hypnosis in addition to acupuncture in order to enable the patients to find their autonomy.